What is the Carbon Footprint of a Concrete Canoe? 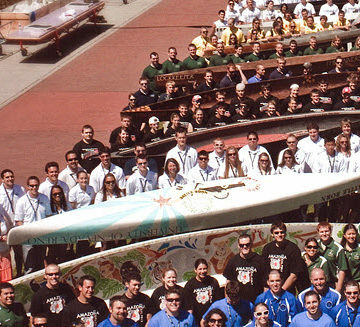 The victor of the 2014 ASCE National Concrete Canoe Competition will be decided this weekend in a no-holds-barred competition at the University of Pittsburgh at Johnstown, culminating what has been a year-long quest for glory (and a whole lot of fun and learning) for ASCE student chapters. Earlier this month, the University of California, Davis, took home the bragging rights as this year’s ASCE/AISC Steel Bridge champions, in another rite of spring for civil engineering students. How many of you out there as undergraduates designed, built, and then paddled a concrete canoe or loaded a steel bridge? 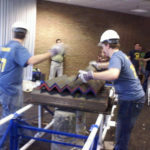 These student competitions have been traditions since the 1970s or1980s, and a geotechnical competition featuring a sand retaining wall stabilized with strips of paper came along much more recently. More than just fun, these competitions require students to perform engineering design calculations and construction planning, as well as to construct the project and test its performance – a valuable introduction to the practice of civil engineering they’ll enter in just a few short months or years. As part of ASCE’s sustainability initiative, the ASCE Committee on Sustainability identified “enhancing sustainability topics in engineering education” as a strategic objective. Of particular importance to the Committee members is sustainability-related education at the undergraduate level. What better way to enhance undergraduate students’ knowledge and application of sustainability than to add to the engineering calculations for these competitions the carbon content or carbon footprint? This exercise also might engage the students’ faculty advisor. Consideration of sustainability has long been an aspect of the competition. While using recycled pizza boxes for molds and flyash in the mix are good sustainability practices, it’s time to challenge students to do the kind of analysis they’ll be called upon to do for their projects. Calculating the carbon footprint will encourage students to analyze the entire process. What about project life-cycle assessment in terms of carbon? Or of cost? The embedded carbon in the materials, particularly in Portland cement, concrete admixtures, aggregate, water, steel, and alloys, will be included, of course. What about the carbon content embedded in different sources of aggregate (bank run, screened, crushed rock)? What about the energy needed to operate power tools for prototype construction and lights in the lab? Oh, yes, is the lab air conditioned? Or transporting the final project and testing team to the competition location? Some readers might be thinking, “Give me a break! We have enough to do just with the engineering of these student projects.” Welcome to the modern world: sustainability is part of the engineering. Treating sustainability aspects as separate from other engineering tasks is increasingly disconnected from what communities are expecting and demanding. Just as copying on both sides of paper and recycling plastic, aluminum, and glass have become corporate culture in most work places, calculating carbon is heading that way, too. Another sustainability thing to think about would be the Envision™ Rating System credit score for the students’ project. What exactly would a concrete canoe look like that was planned for deconstruction? How would that concept affect design, construction, and performance? These may seem like difficult questions right now, but don’t lose sight of the fact that a few decades ago analysis of a statically indeterminate beam was a difficult question, too. Engineer-up to the sustainability situation. Treat it as an opportunity, not only as a problem. 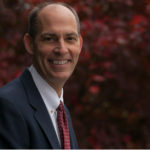 Jeffrey R Keaton, Ph.D., P.E., P.G., D.GE, ENV SP, F.ASCE, F.GSA, is Principal Engineering Geologist with AMEC Americas, Los Angeles. Jeff is a member of the ASCE Committee on Sustainability and is a past chair of the Technical Coordinating Council of the ASCE Geo-Institute. He is also a member of the executive committee of ABET’s Engineering Accreditation Commission.